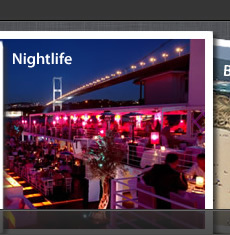 Istanbul is surounded by beaches, with twenty-plus beaches in Istanbul city to choose from. you may have a hard time picking one or two to visit during your vacation. We’ve compiled a list of the best Istanbul beaches with beautiful, clean water and plenty of fun activities. After spending a day at one of these beaches, you might reconsider spending the money, time and effort on heading down south of Turkey, when you can have just as satisfying of a beach vacation right here in Istanbul. True Blue Beach has a beautiful view at the sea. You see the islands and the sailing boats from KalamÄ±ÅŸ Marina and you can watch a beautifull sunset. True Blue has a nice sandy beach, swimming pool, excelent restaurant and bar with live performances. In the middle of the garden the is a nice Bar which serves good cocktails. True Blue is one of the most popular beaches in Istanbul and during the summer there are concerts and live events. True Blue is the most popular beach club in Istanbul, with elite interior design, unique sea view and ambitious menu. BURC Beach is one of the most famous beaches located along the Black Sea coast and belongs to BogaziÃ§i University. With its seemingly never-ending seashore, decorated with beach umbrellas, a beach bar and beach-goers partaking in water-sports of all kinds, BURC will make you feel miles and miles away from the city. We guarantee you wonâ€™t get bored here; between enjoying the sea, playing beach volleyball, relaxing over a quick bite and drink at one of the cafes or bar and joining one of the beach parties in the evening, you wonâ€™t realize how quickly the time has passed! GÃ¼mÃ¼sdere, Kilyos Open everyday from 09.00-21.30. Dalia Beach, another favorite, is located on the Demircikoy cove. This beach is for those who believe a day at the beach should be relaxing and tranquil. Though Dalia is spacious enough to guarantee a bit of privacy and green enough to delight even the most judgmental nature-lovers, you can still enjoy some physical activity if you so choose. There are areas designated for trekkers as well as paddleboats and canoes available for use; beachgoers can also partake in beach volleyball and surfing. The food and drink options have also been thought out with care and attention and is prepared with regional products (the feta cheese comes from Ezine, while the honey comes from Fethiye). The fish menu is also the perfect way to end your day. The Dalia Beach CafÃ© provides enough options to satisfy any palate. Golden Beach is located in Rumelishisari, where the Sea of Marmara and Black Sea meet. There are plenty of activities at Golden Beach including beach volleyball, paddle-boating, a rock-climbing wall, mini-golf course and walking track. Camping Restaurant, Kir Kahvesi, Snack Bar and Beach Bar will keep you hydrated and nourished throughout the day; you can indulge in international dishes or opt for seafood, both are available. Sipping a cocktail as the sun sets is a must at the Beach Bar. Those who choose to spend the night can stay in one of the 26 bungalows or at a boutique hotel. The beach officially opens at 08.00, but does not close, perfect for those who enjoy late-night swims. Entrance is 15TL during the week and 30TL on weekends. This beach lives up to its name: there is nonstop activity here! Water sports, beach volleyball, tennis, basketball, beach parties at night and concerts are just some of the activities you can enjoy while here. The beach has a restaurant, beach bar and terrace bar. Active types will enjoy Jetskiing, banana-boating, canoeing and paddleboating. At over 30.000m2, Solar Beach is one of Turkeyâ€™s largest private beaches and open-air performance areas. With its expansive seashore, concert and performance stages and endless sports activities, Solar Beach keeps you busy from the minute you arrive till the minute you have to leave. The beach is 1km long, which means it can compete with the best beach clubs of Antalya or Izmir. The beach club also features a Beach Bar, Solar Bar, BBQ Corner, 6 extra bars and 4 extra eating areas used primarily during special performances, Kids Club for families with kids, enough chaise lounges and cushions for 3000 guests, 9 sunbathing terraces and of course showers and dressing rooms. The sporty types can partake in windsurfing, jet-skiing, banana-boating and inner-tubing. Entrance is 15TL during the week and 25TL on weekends. 0212) 201 10 12/ 26 12? Uzunya used to be known only for its popularity among fisherman; however, in the last few years it has been renovated and word has traveled fast as its now frequently crowded during the summer. We have to mention that Uzunya is the most natural, or undisrupted, beach on this list. The beach umbrellas are made of wicker and you can lay out on either grass or sand. The fish restaurant offers fresh fish daily as well as seafood; the cafeteria has tost and izgara (grilled chicken, meatballs etc.) options. The entrance fee had not been released as of press time. We had heard that Wattabe was Turkeyâ€™s first natural sports center. This venue is 55 kilometers from the city and built upon a huge estate located right on the river. Nature lovers will enjoy sprawling out on the grass or hiding out under the shade of one of the many trees. There are a handful of unique activities available at Wattabe; mountain biking, ATV-ing, canoeing, surfing, windsurfing and even paintball. Whatâ€™s great about Wattabe is that you can take advantage of these activities or just lay out on the grass; all types of leisure are welcome. Those who wish to stay the night can set up a tent. The restaurant has grilled meats, salads, breakfast and fresh vegetable dishes in olive oil (zeytinyaglilar). Open weekdays from 08.00 and weekends from 09.00 onward. PoyrazkÃ¶y is a typical fishing village, located on the Asian side, and also one of the closest settlements to the Black Sea. To get there, head past Beykoz; 4km after youâ€™ve passed Beykoz, on the left-hand side, youâ€™ll notice a sign for PoyrazkÃ¶y-Anadolu Feneri (lighthouse). Youâ€™ll then continue through the forest on a narrow, windy road. Heading towards the Anatolian Lighthouse, on the left youâ€™ll see the road sign indicating PoyrazkÃ¶y, and youâ€™ll head down towards the Bosphorus shore. Youâ€™ll turn left without turning into the village to get to the PoyrazkÃ¶y beach. The beach, which is not very large, is surrounded by small and large facilities. Youâ€™ll find a dressing room, restaurant and cafes. PoyrazkÃ¶y is protected from wind and strong water currents, and is thus ideal for casting anchor. 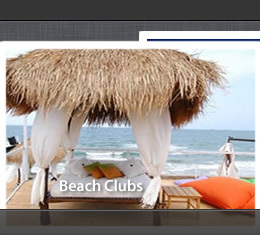 The fine sand on the beach is ideal; chaise lounges and umbrellas can be rented if desired. There is also a separate section for women only at the end of the seashore. 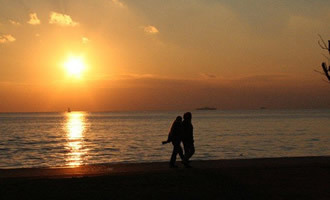 Photo Couple on Bostanci Beach by Cengiz C.
True Blue is closed now. That’s what we were told, when we couldn’t find it, the other day. The thing is – you have to go to Black Sea for clear ocean waters. Solar Beach is very nice, if you are into loud techno music. Beautiful water and powder sand. Alternative: Suada Club on Galatasaray Island by Bosphorus Bridge is a great up scale celeb favourite, if a 50 meter pool with 4 restaurants can do it for you. We loved it. Entrance 80 Lire, free boat transport. Thanks for sharing Eilif. Suada is amazing indeed! I saw above beaches but which one is the best to go? We want to have jet sky n other entertainments fun. Hello, we are in Fathi for few days . Can you help me any beaches near by for swimming with my little girl. How to get there . Will be greatful if you can guide me .